James and Jan have begun leading annual photographic and observation safaris to Africa. After years of people asking to come along they decided to share their experiences with other interested and like minded people. This trip is not your average "run of the mill" dash around Northern Tanzania tourist circuit. This trip is designed for nature lovers and photographers who want to spend time fully exploring a few unique areas. We will visit Tarangire - a spectacular park known for its huge baobab trees and one of the largest populations of elephants in Africa. We will then go on to Lake Manyara which normally is used just as a quick stop-over on the way to the Crater. This wonderful little park has a huge lake full of flamingos, fish eagles and other birds and a moss-draped forest where you can see unusual jungle birds and antelopes and its famous tree climbing lions. We will then fly to the Serengeti where we will stay in two different semi-permanent tented camps in two locations within this magnificent park. Please see itinerary below for full details. Group will arrive independently and overnight at the historic Arusha Hotel. James and Jan as tour leaders will lend their expertise as they have been traveling to Africa and leading groups for several years. full of information on getting ready for the trip, what to expect, what to bring and more. James is also available by phone or email to ask any questions prior to the trip. Certified naturalist guides driving 4 x 4 extended Toyota Land Cruisers. They will work hard to find the animals and to position us to the best advantage for photography. 6 people maximum per vehicle with guaranteed window and roof hatch access. Many economy tours use mini buses that are loaded to capacity with no guarantee of window or roof edge access. No more than 15 people total on the trip including Jan and James. 8 minimum needed to fill trip. Average 8  10 hours a day in bush. Most days we will go out with a boxed breakfast to be able to catch the wonderful morning light. Many economy trips only spend a few hours a day in the field. Photos of you. Most travelers never have pictures of themselves  but James and Jan will be taking photos of the group during the trip and provide free a CD once home. All meals are provided starting the morning of June 18. These meals are geared to American and English taste and are hearty and plentiful. All accommodations are covered. The lodges are first rate and the semi permanent camps are brand new. Bush plane from Manyara to Serengeti and from Serengeti to Arusha. Transport from Mt. Kilimanjaro airport to Arusha Hotel and return from Arusha to Mt. Kilimanjaro. Our trip will be hosted by SAFARI LEGACY (formerly Tanzania Photographic Safaris). This company is family owned and has been providing first rate safaris since the 1970s. You can see more information on them at www.safarilegacy.com. As a unique reminder of your trip we are working out the details of a gift certificate towards a painting by Jan. More on this later. International airfare to Tanzania. Safari Legacy will be happy to arrange for you through their consolidators. You will fly into Mt. Kilimanjaro airport not Arusha. Tips to guides, hotel and camp staff. Laundry, bar and other incidentals in camps or hotel. James in the mobile tented camp in the Serengeti downloading his camera to his computer using solar power. 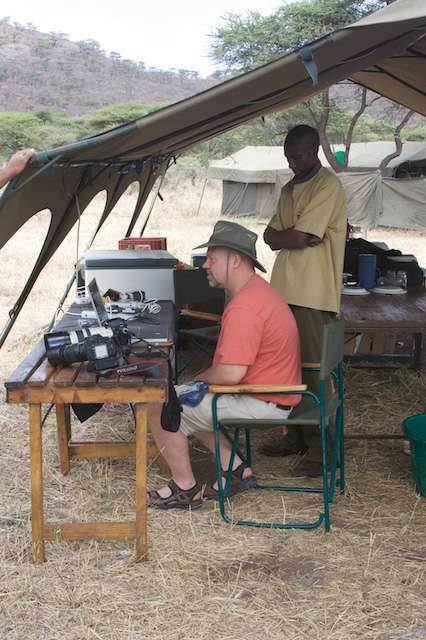 The camps, although mobile tented, can meet all the requirements needed for charging batteries for cameras, laptops etc. 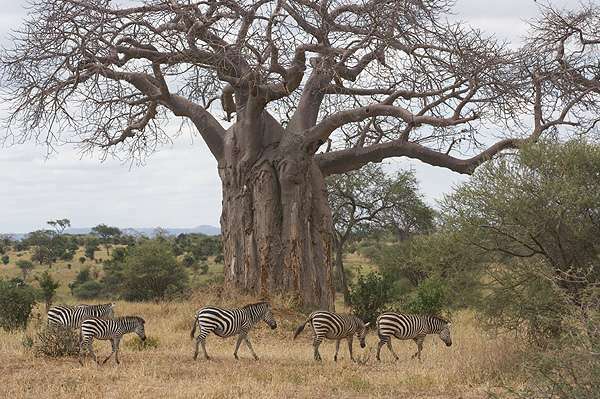 Magnificent Baobab trees can be seen in large numbers in Tarangire National Park. 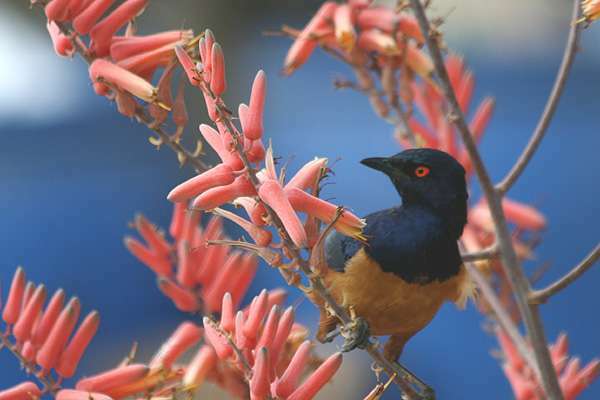 The birds are wonderful in all the parks - here is a Hildebrandt's starling in an aloe plant. 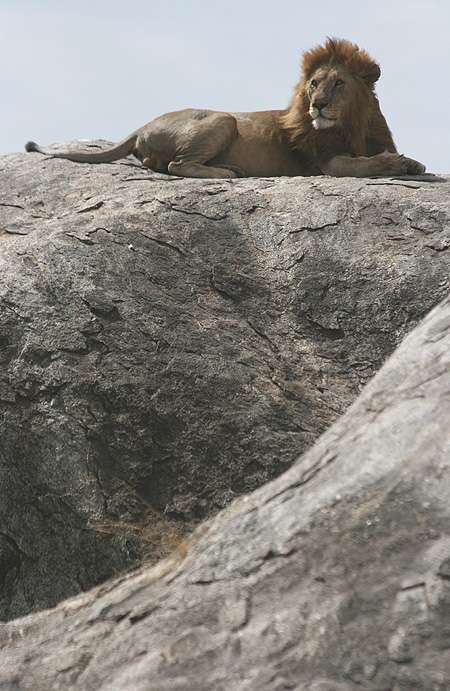 The Serengeti has wonderful rock outcroppings called kopjes where lions and leopards like to hang out. Here is a magnificent male lion lounging on the top of a kopje.